There are a lot of batteries available in the market in terms of technology. Some of them are lead-acid batteries, tubular batteries, and maintenance-free batteries. First, understand the difference between them and pick the right one by consulting an expert. Lead acid batteries need regular maintenance and upkeep. You must check electrolyte levels regularly and keep refilling at a regular interval. Tubular batteries are handier as compared to the lead acid batteries. Hence, more expensive. These batteries require minimal maintenance work, promise higher efficiency, and longer service life. Whereas, maintenance-free batteries are the sealed lead-acid batteries. They require minimal or no maintenance. 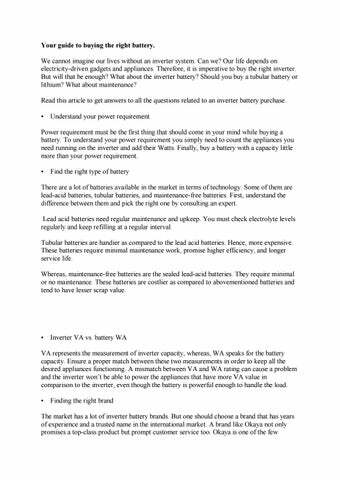 These batteries are costlier as compared to abovementioned batteries and tend to have lesser scrap value. inverter Battery Manufacturers In India that offer their products as well as customer services online. Visit www.okayapower.com to compare prices, Buy Inverter Battery Online, book a service, register your product and escalate your request in just a few clicks.